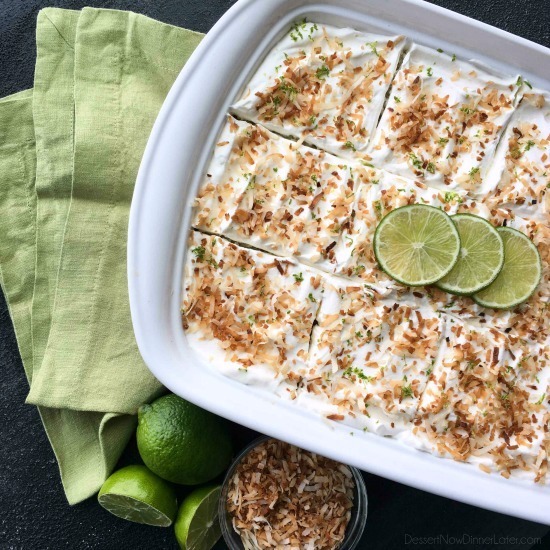 Coconut Lime Poke Cake - Dessert Now, Dinner Later! 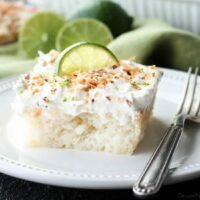 Coconut Lime Poke Cake – a fluffy, white, lime-infused cake that is soaked with coconut cream, and topped with sweetened whipped cream, toasted coconut, and lime zest. It’s super moist and full of tropical flavors! 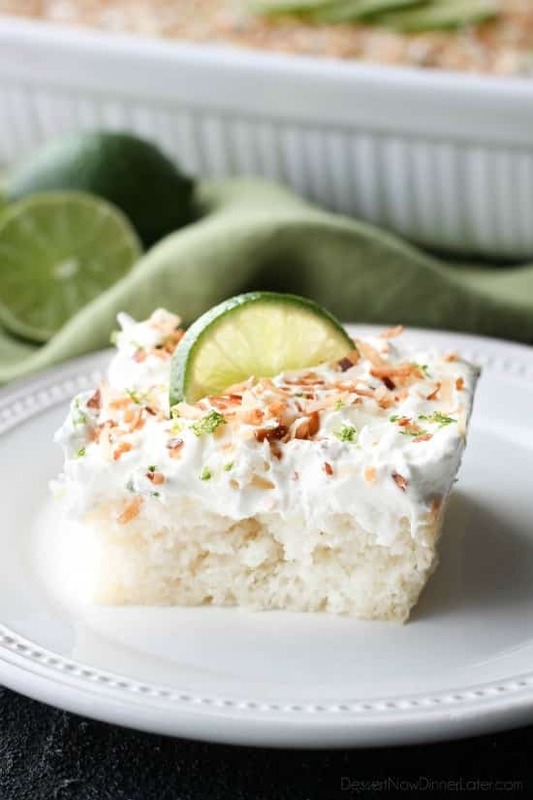 One of my most popular recipes on this blog is my Coconut Cream Poke Cake, which is wonderful as it is, but I have been toying with the idea of adding lime to it, and I’m so glad I did! 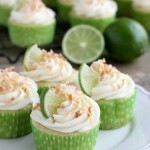 I do have slight coconut and lime addiction – an addiction to each element separately, as well as combined together. 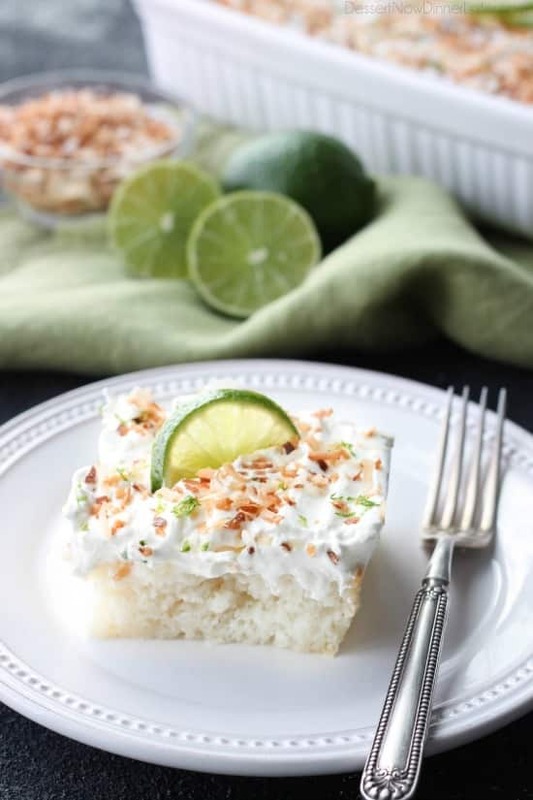 And this Coconut Lime Poke Cake is a wonderful marriage of the two tropical flavors. 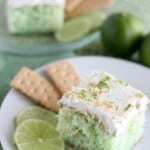 This cake starts with a boxed mix, but with the addition of lime and coconut, it’s not your typical boxed cake. 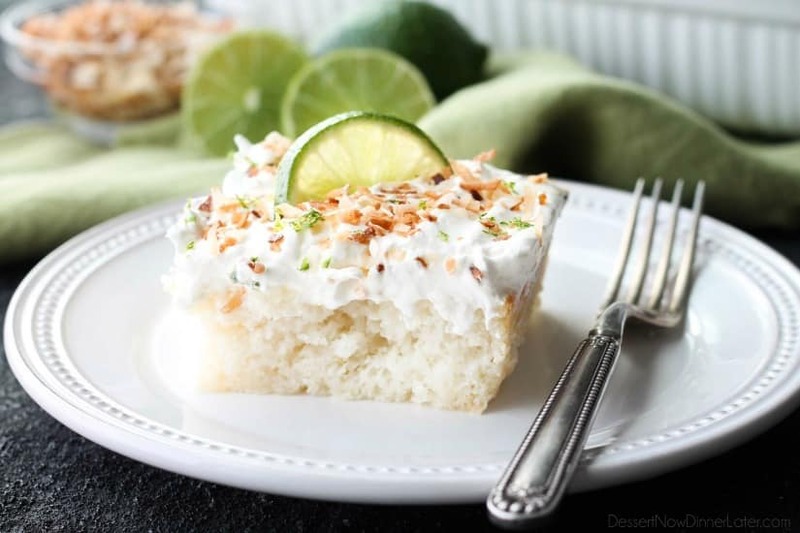 There is lime juice and zest in the cake, coconut cream soaked into the cake, and extra toasted coconut and lime zest on top of some fresh, sweetened whipped cream. Delicious! 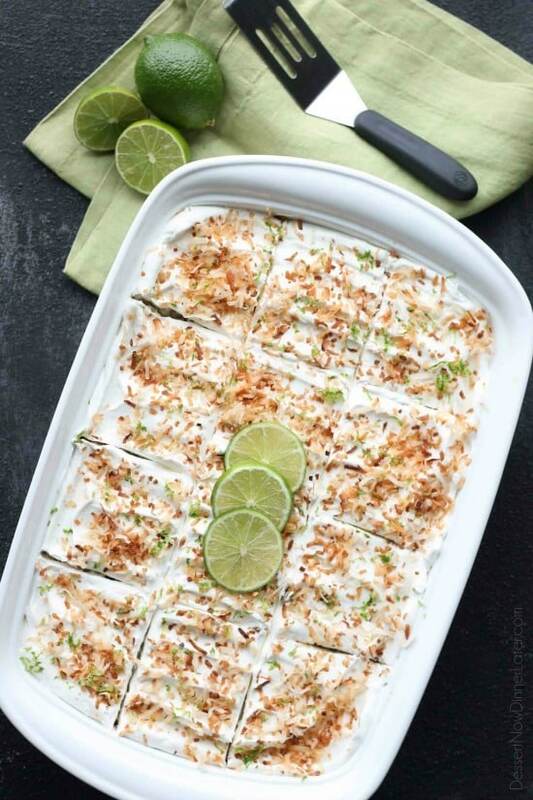 Coconut Lime Poke Cake is perfect for parties and potlucks because of its simplicity, but will be unique enough to stand out among all the choices at the dessert table. I hope you love this cake as much as we did, and be sure to check out my other coconut lime desserts if you’re in love with this fruity combo! In a large bowl, briskly whisk together the ingredients for the cake for 2 minutes. Pour batter into a greased 13x9-inch baking dish. Bake for 27-30 minutes or until a toothpick comes out clean from the center. Allow cake to cool to room temperature. Meanwhile, toast coconut in a sauté pan over medium low heat, stirring constantly until golden brown. Remove pan immediately from the stovetop, and put toasted coconut in a heat safe bowl. Set aside to cool. In the bowl of an electric mixer with the whisk attachment, whip the heavy cream and powdered sugar until stiff peaks. Set aside. Using a fork, poke holes all over the top of the cooled cake. 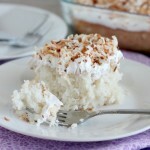 Open the can of cream of coconut, empty it into a 2-cup measuring glass, and heat it for 15-20 seconds in the microwave. Whisk the mixture well and then pour it all over the cake and into the holes. Allow the cake to soak up all of the Cream of Coconut, about 5 to 10 minutes. 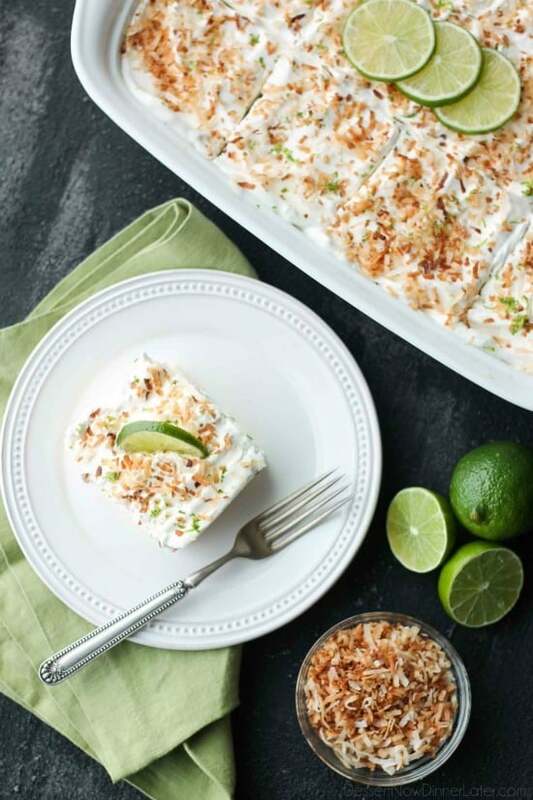 Frost cake with the whipped cream, toasted coconut flakes and lime zest. Serve immediately. 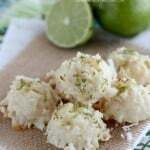 (If preparing ahead of time, don't add the toasted coconut until just before serving because it will soften.) Keep leftovers refrigerated.